I recently discovered an app I really think is great called The Daily Dozen. On it is a list of foods you should be eating every single day, with spaces for a checkmark next however many servings of that food you should be having. For instance, there’s three spaces next to beans, one space next to berries, and two spaces next to greens. You can check in to the app throughout the day to keep track of the “superfoods” you’re eating and over time, hopefully you’ll have trained yourself to put the healthiest foods first in your diet. There’s a section for grains on there, and I think that’s important to note. A lot of people avoid grains these days because they believe they are inflammatory or cause weight gain. Here’s what I know about whole grains (I’m talking about things like brown rice, oats, and barley here, not Froot Loops with “whole grains”). Eating whole grains is associated with lower risks of diabetes, heart disease, and high cholesterol. Read here for more information on whole grains and heart disease. Read here for more on whole grains and blood pressure. And read here for more on whole grains and other foods that lower cholesterol. If you are trying to avoid grains in the short term, I support that. Sometimes avoiding a certain food for a month or so can help reduce inflammation and de-sensitize you to that particular food. Then you add the food back in in small amounts to ensure your sensitivity is gone. There are doctors like Dr. David Perlmutter (author of The Grain Brain) who have profited mightily by telling people all grains are bad for you, but I really don’t subscribe to that thinking at all. I *do* believe we Americans have too many grains in our diet, and that most of those grains are of low quality and low nutritional value (think a slice of white bread or a bowl of sugary cereal). However, whole grains have many proven health benefits. Back to the app. 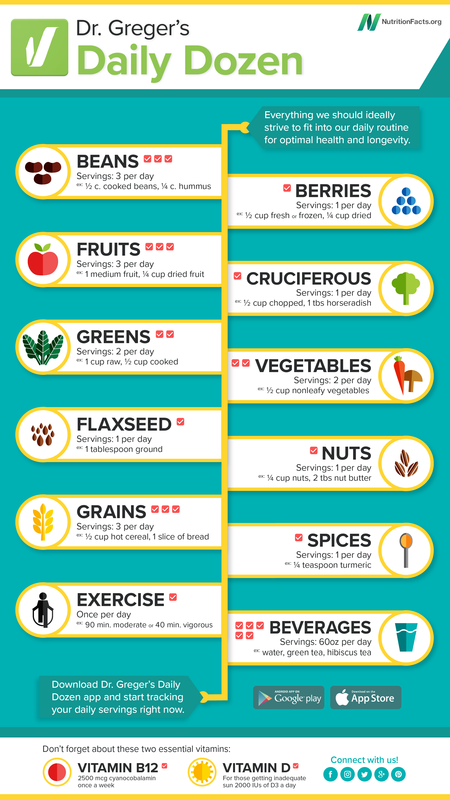 What I love about this new tool is that it also includes things like spices, flaxseeds, and Vitamin D. These recommendations are all rooted in science and have been proven to be beneficial for one or more reasons. Daily Dozen was created by Michael Gregor, M.D., who is the founder of NutritionFacts.org and has a podcast called Nutrition Facts with Dr. Gregor. I think it’s a great daily tool you can use as a fun challenge to clean up your eating habits and add some solid nutrition that will help reduce your risk of disease. Win/win!